I had (and still have) plans for numerous things to write about on here this year but real life has been taking precedent for the last few months. I’ve started a new job which currently means many hours of commuting every day and when I’ve not been doing that, I’ve had my hands full getting my house ready to sell. That’s now on the market so in the hopefully brief lull before I have to worry about moving, I might manage a post or two. 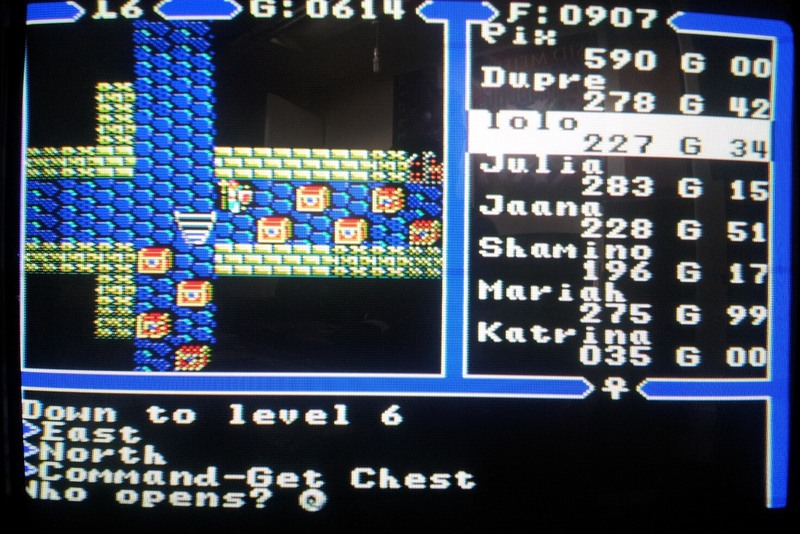 I’m sure all Ultima fans are aware of the fan patches that add MIDI support to some of the early DOS Ultimas. 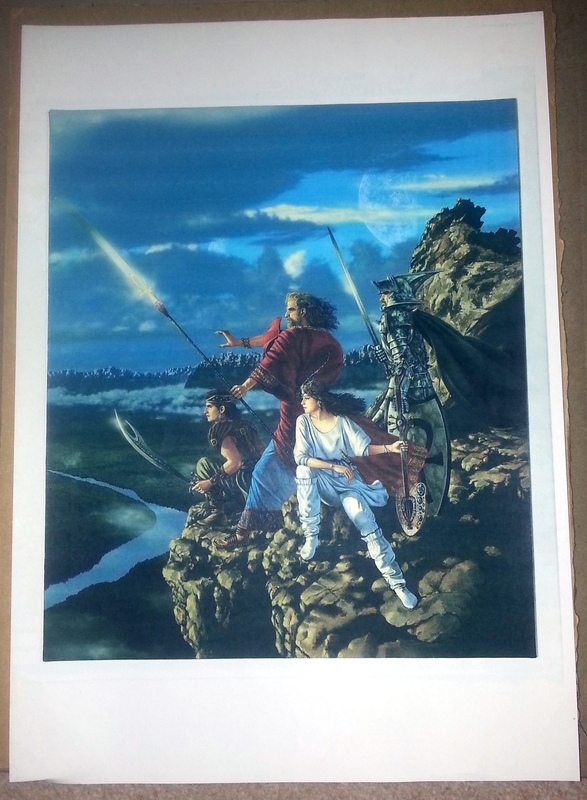 What is somewhat less well known is that the earliest two Ultima games to support music had built-in MIDI support from the beginning on the Atari ST. This is something I’ve been wanting to try out for ages. 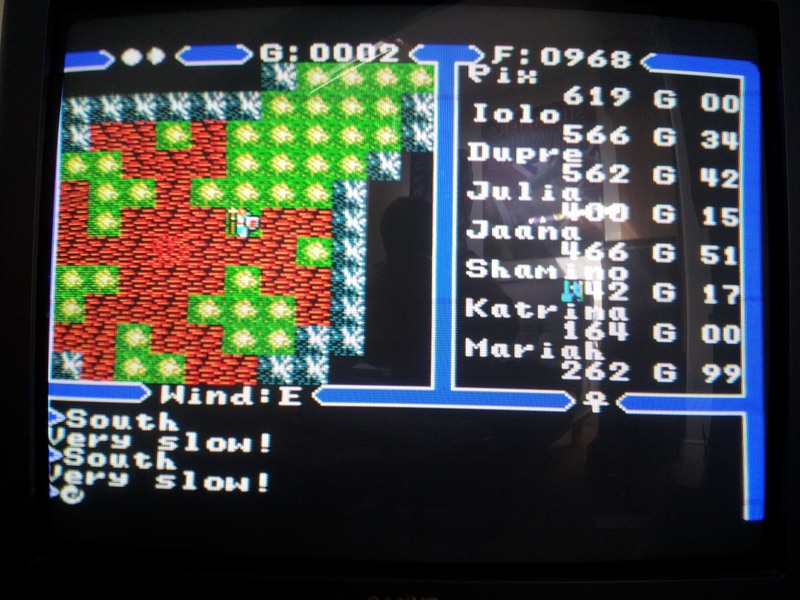 First off, a quick look at Ultima 4 running without MIDI. Apologies as ever for the usual quality of the video on here as I’m still just pointing my phone at the screen. The built-in Yamaha sound chip on the Atari ST is in effect the same as on the ZX Spectrum 128 or Amstrad CPC, i.e. a 3 channel beeper. 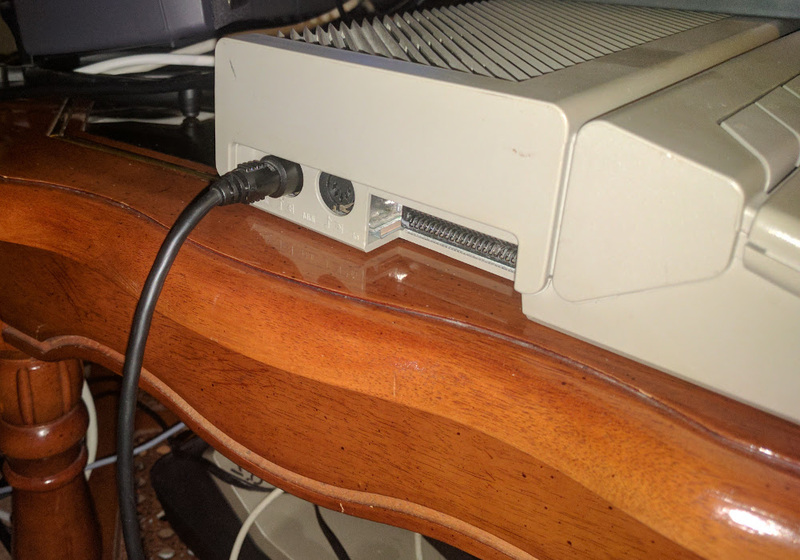 It’s not horrible but it lags way behind the Amiga which would come out mere months later. 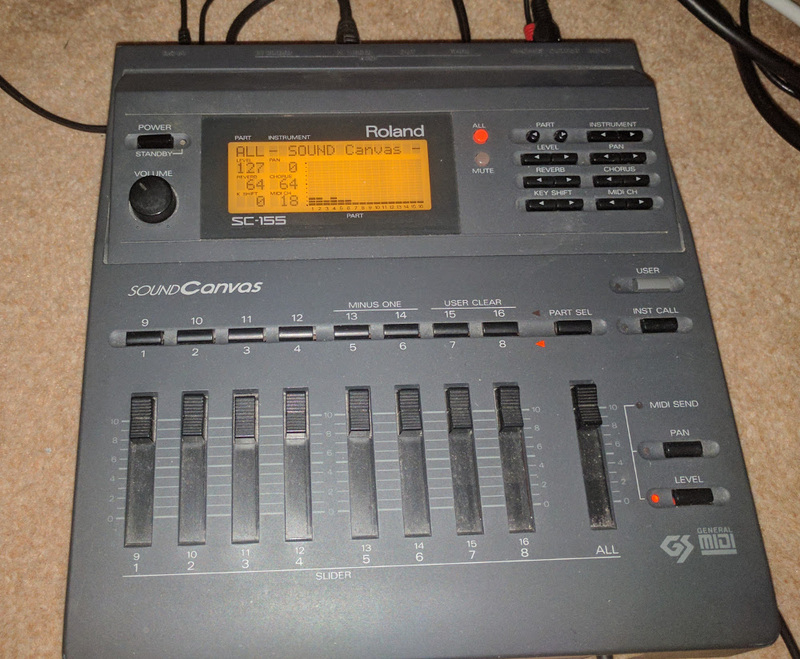 The built-in MIDI support of the ST was a unique feature, leading to the machine being used for years in music production. Watch enough 80’s Top Of The Pops and you will see the occasional ST driving synths. MIDI didn’t see a whole lot of use in ST games in truth. Sierra included MT-32 support for some of their games and were the main proponents. I can’t imagine many gamers took advantage of this given that the MT-32 would have cost far more than the ST itself. If you had that sort of money, you probably had an Amiga or PC by then. 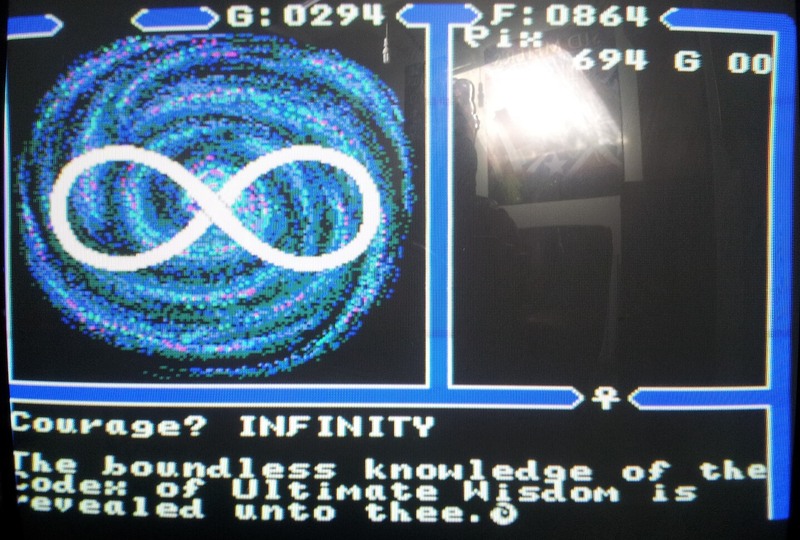 To the best of my knowledge, Ultima 3 and 4 were the only Origin games to support MIDI on the ST.
A little more experimentation is definitely required but I ran out of time. It’s certainly a nice extra to have included in the game for those ST owners who had the extra hardware. 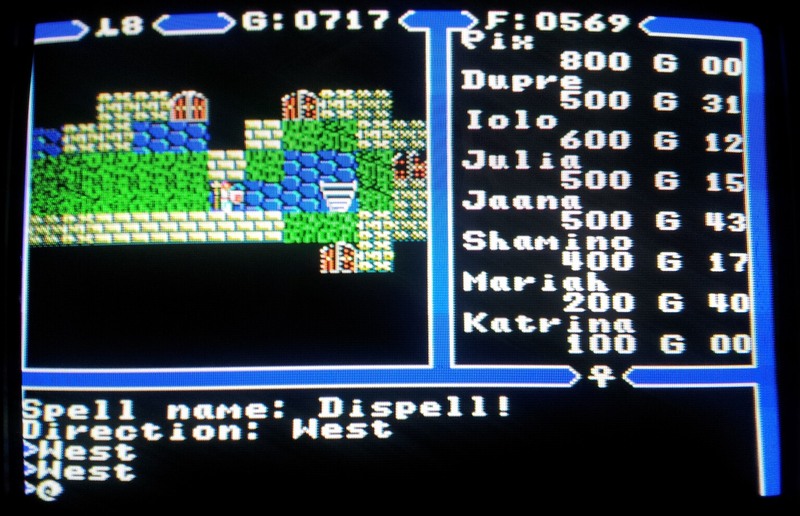 Ultima 3 works in the same way, except all the notes are on the one channel meaning you can only pick the one instrument (at least without more advanced equipment to process the MIDI). I’m back just in time for Xmas with another Origin relic dating from January 1992. 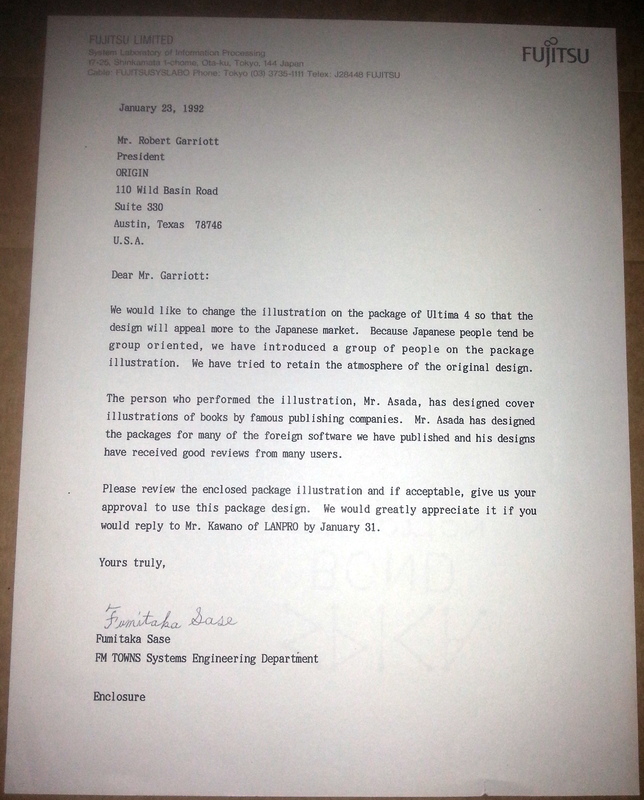 This is a letter from Fumitaka Sase of the Fujitsu FM Towns department to Robert Garriott asking for permission to use an alternative cover for the FM Towns port of the game. He cites his reason for the change being that Japanese tend to be group oriented so they introduced a party on the cover while trying to maintain the same atmosphere. 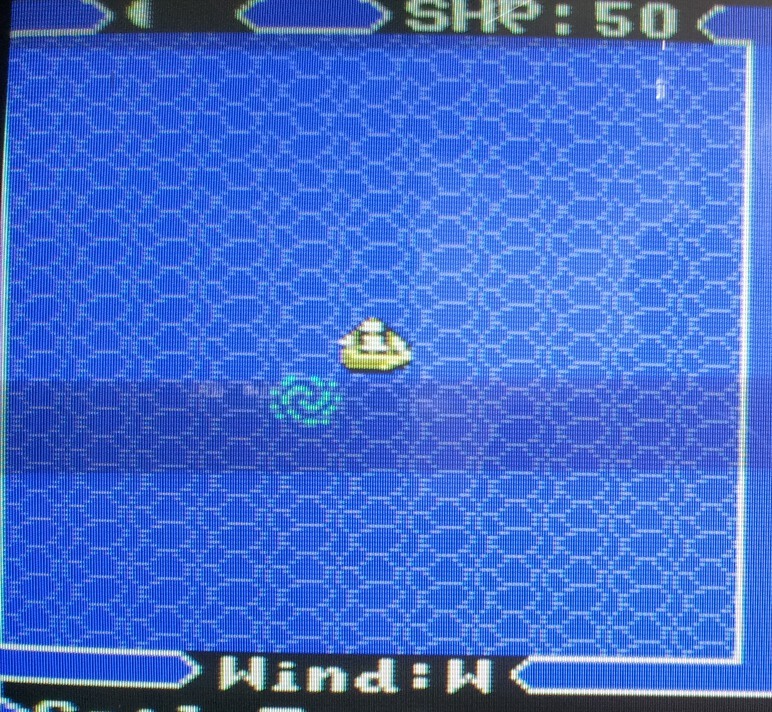 The team behind the NES port in Japan clearly felt differently keeping the single figure of the Avatar which was used on just about all of the other ports. To go along with the letter there was a print of the illustration which is identical to the one ultimately used on the cover as far as I can see. This unadulterated version doesn’t have all the text/logos obscuring it and was slightly cropped on all sides for the final box art. I can’t promise that posts will be any more frequent in coming months on here but I should have a new “tour” of the collection coming up over the holidays for those curious about how many games, gaming systems and related ephemera it’s possible to pack into one small loft conversion. 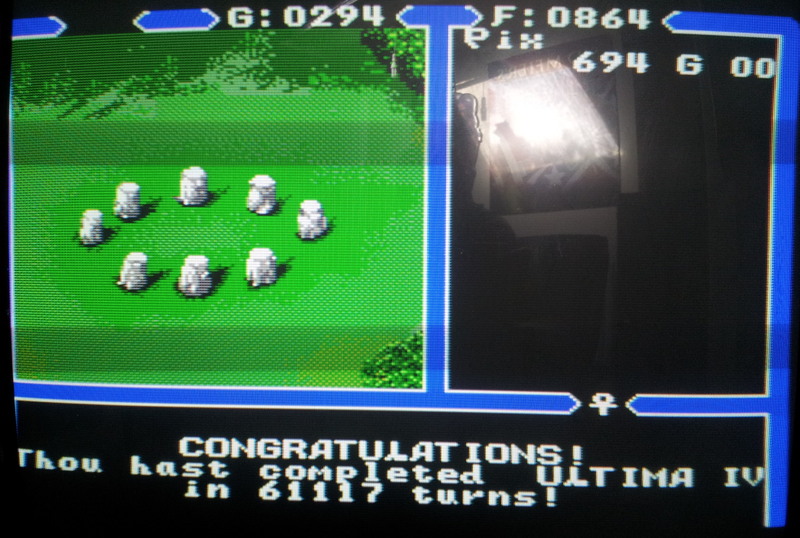 I’m also hoping to get started on SNES Ultima 7 sometime soon but for now I’ll just wish a happy Xmas to all. Before I start this post apologies for the even worse than normal “screenshots”. Sunny days and a roof window do make for a good combination when taking photos of a glass screen. 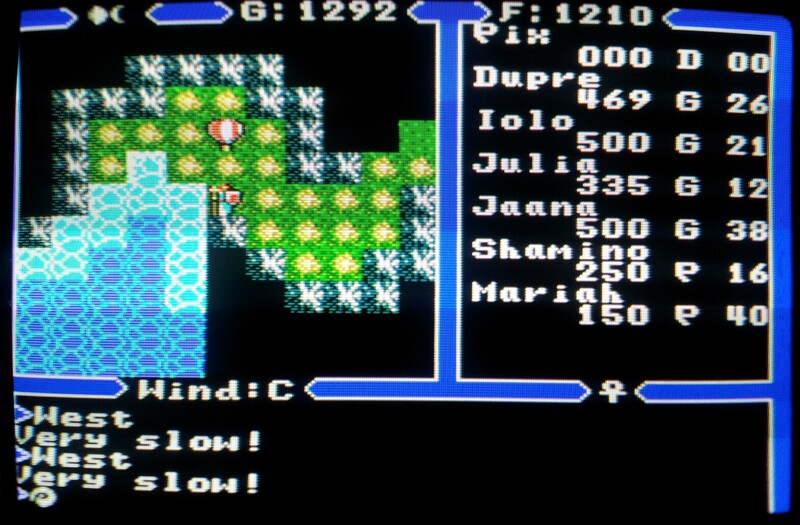 I should have been out making the most of the weather really but Ultima 4 had to be finished. I’ve already said about everything I want to about the game so this post is just going to be tidying up. 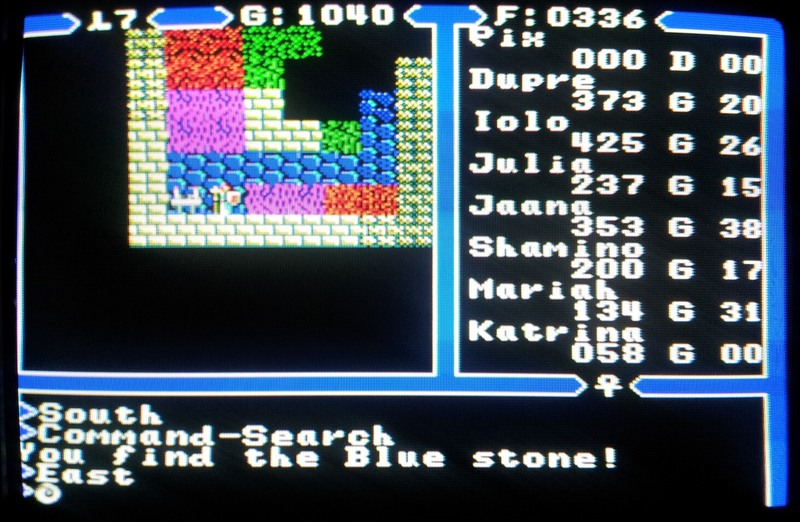 I had originally planned to do some dungeon delving for gold + stats at the end of part 4 but after gathering a small pile of mandrake and nightshade I decided that I was probably up the job as was and headed in for another go. 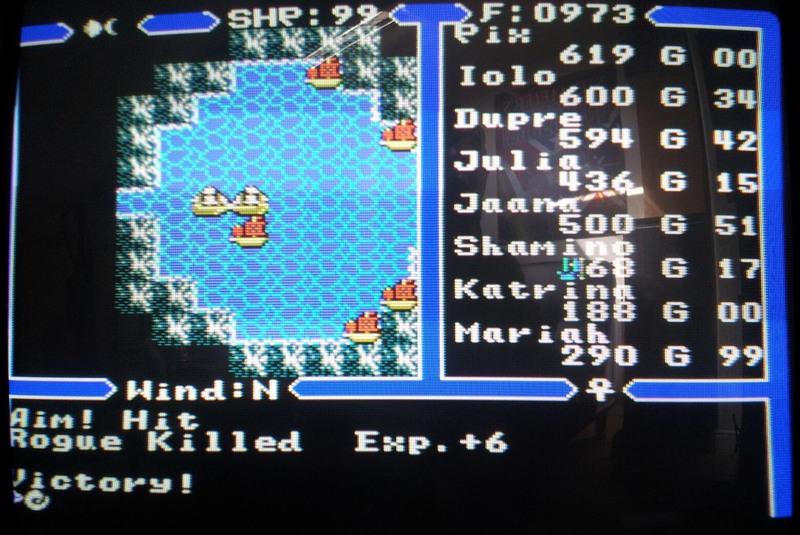 I ran into a slight bug around this time with the first digit in Shamino’s health being replaced with a random symbol – this seemed to occur when shifting party order around as I’d put Katrina and Mariah up front for a while to raise their levels. 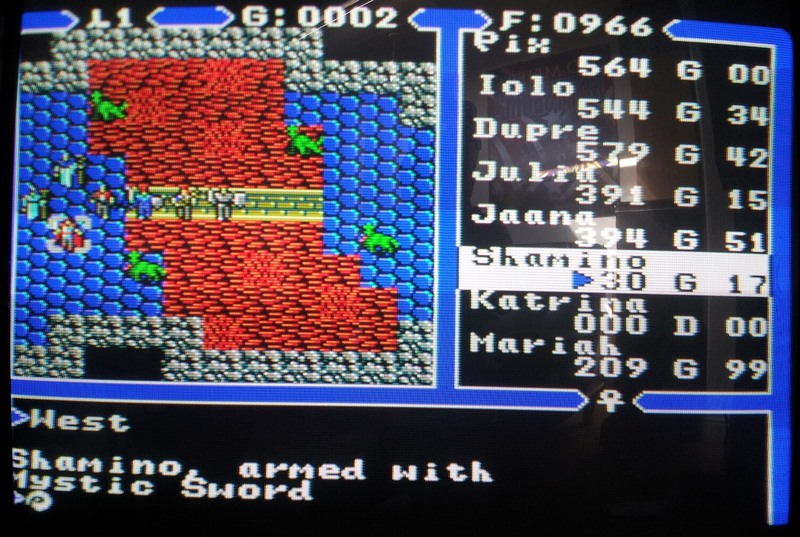 The bug wasn’t a big deal although I never had any idea how much health Shamino had from this point on. … to be faced with the same lava filled rooms once more. Only Katrina fails to make it through them this time and I’m equipped to cast resurrect this time to get her back. Progress after this is slow and steady once more. The room that did for me on the first attempt is still not easy but quickness spells just about get me through it with Iolo once again having to charge a forest of Reapers single handed. This room was by far the toughest one in this version of the game. With no saving allowed making it to the bottom of the abyss is quite an expedition and must have taken me going on a couple of hours before I made it to the famous room where I get to fight my own party. It may take some time but playing through all the rooms in the abyss again is immensely enjoyable though. My memory is nowhere near up to remembering how to get through them all and figuring out all the secrets adds a welcome puzzle element in these later stages. The amount and variety of gameplay packed into U4 for a 1985 title never fails to impress. 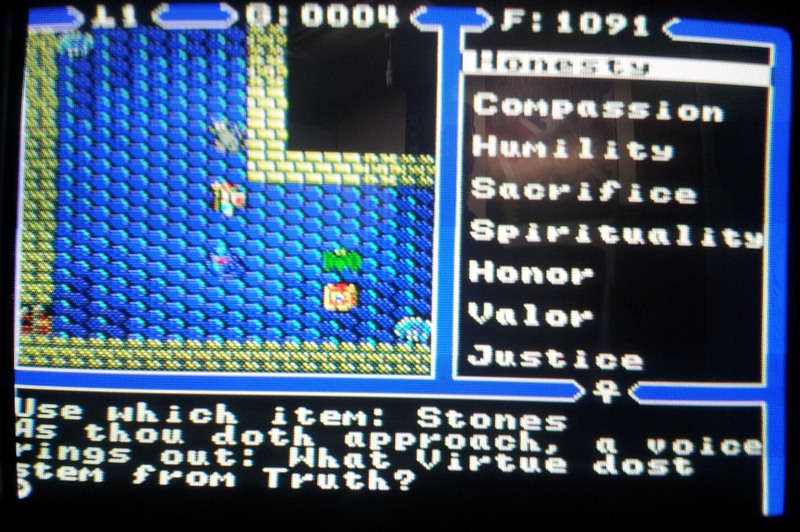 For the final part of the game, I have to enter all the virtue question answers manually. This means no picking off a list which is probably as well as I’m sure I didn’t learn everything I should have while playing. After which my quest is over and I’m returned to Earth with my example of Avatarlyness having been set back in Britannia. It’s a slightly ignominious ending after such an epic quest really but somehow fitting and hinting at future sequels. 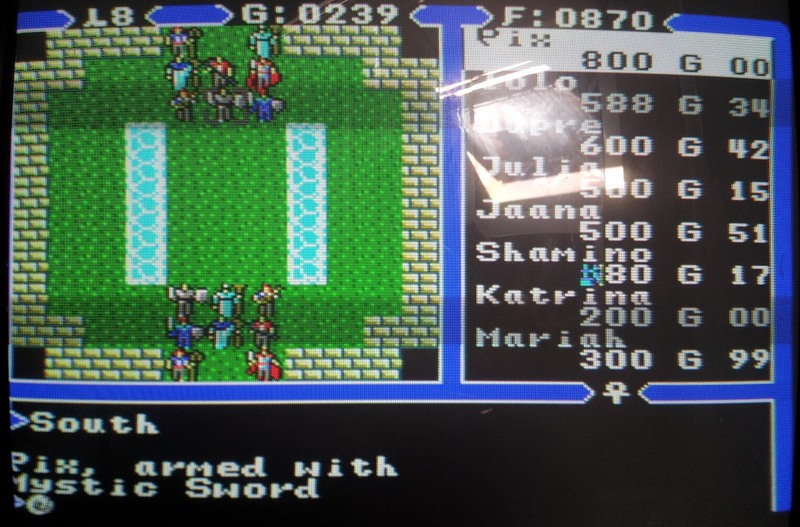 It’s all there anyway and looking a whole lot better than in EGA just like the rest of the game. It’s a pity this isn’t the version of Ultima 4 on GOG really as it’s considerably more accessible than the DOS one. I’ve seen numerous posts on the forums there from people who can’t even get past the menu screen since the arrow keys and mouse don’t work. Maybe GOG will start supporting emulated games one day. Whatever the availability, I’ve got a new answer for the next time someone asks which version of Ultima 4 they should play. If I ever find a copy of the FM Towns version, that could well change again of course. It’s been a while since I plugged a Kickstarter but the guys behind The Neverhood are trying to raise the funds for a new game called Armikrog. This will be a claymation adventure game in the same style which is easily enough for me to back it. Not sure what game will be coming up on here next. Definitely not an RPG as I’d like a change of pace but there are several space shooters I’m considering so probably be one of them. I’ve had a good play around on the BBC in the last day or two running into loads of games I’ve not seen since I was in junior school. 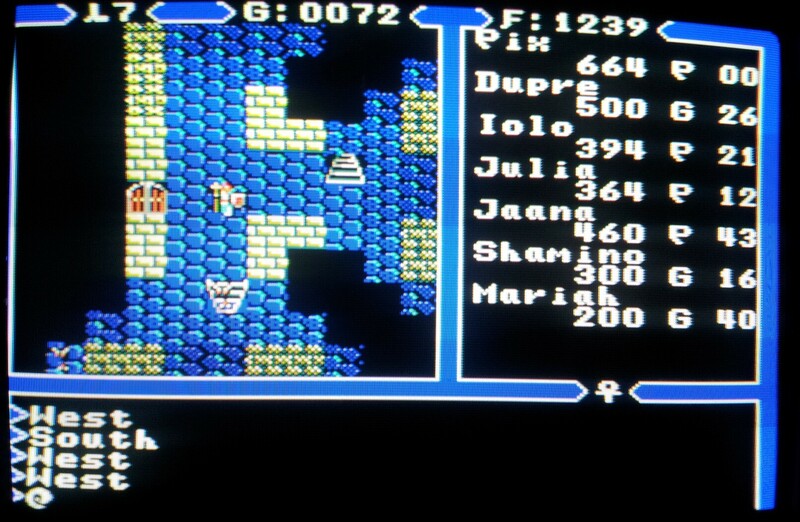 As fun and nostalgic as that was I prefer to tackle one game at a time and I couldn’t stay away from Ultima 4 for long. First I finished off raising my Avatar in every virtue and gathered some of the items I was missing while I was at it. I then decided to attempt Hythloth so I could take advantage of the stones in there to raise my Avatars stats a little. 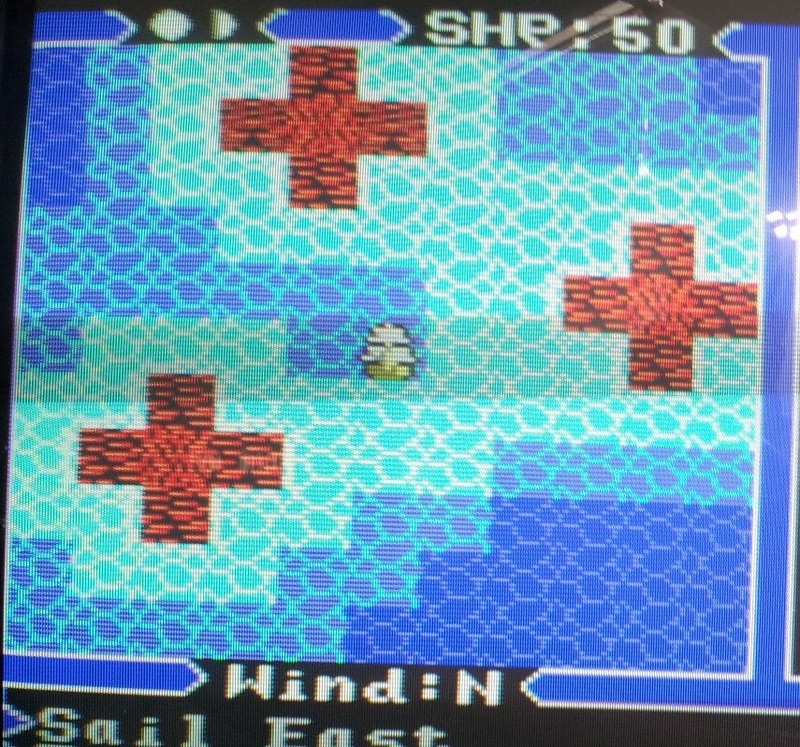 This is where I finally reach the major departure from other versions of Ultima 4 in that all the dungeons are presented in overhead 2D using the same tiles as the rest of the game. Roughly speaking each tile of the 3D map is represented by a 2×2 block here although there is some interpretation. 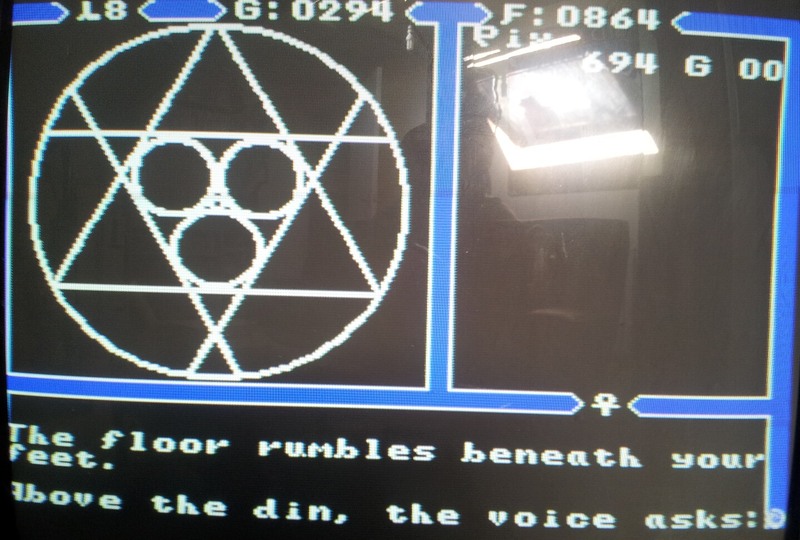 The SMS is clearly capable of 3D dungeons so I’m sure this was done for storage reasons. 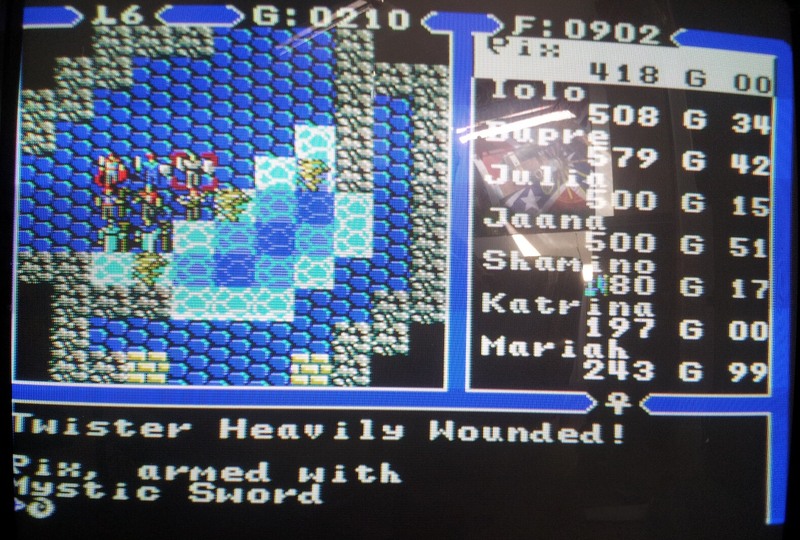 Dungeon and monster graphics would no doubt have eaten into cartridge space and if other aspects would need to have been cut it was definitely the right call. The basic layout of every dungeon level is exactly the same as the original and it also contains each and every room within these so nothing is missing as such. It removes the maze aspect when you can see so much of the map in one go though. I do still have to contend with the same occlusion as on the overworld but some of these maps only make sense in 3D. For example one level is simply crisscrossing corridors with one ladder up and one down at different intersections. With the map wrapping at the edges fining the way out took a bit of effort in 3D. Here I can see where I need to go from the start and there is never going to be a problem avoiding monsters with all those intersections to hide in. This isn’t how you would design a level if you knew this was how it was going to be played and is perhaps a case of the port being too faithful. This does make this section of the game easier in one sense but for most levels I’m surprised just how well the transition has worked. 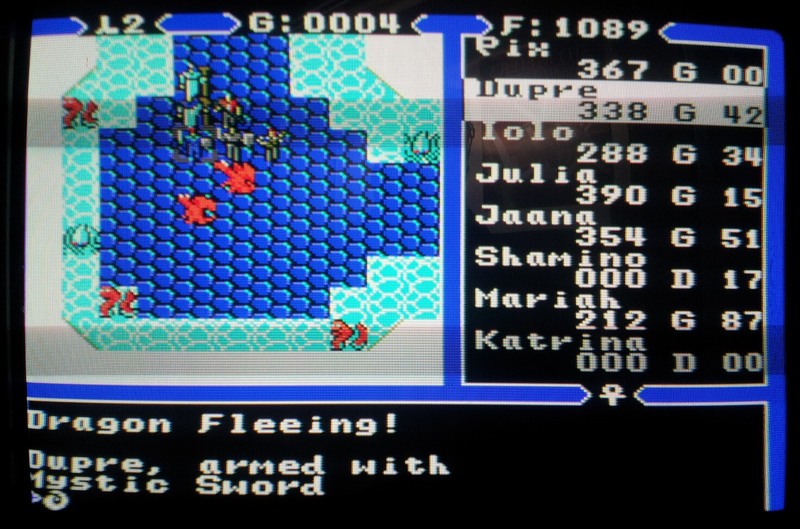 The 3D dungeons were always a peculiarity of the early Ultima series in that they came across as a game within a game, which is of course exactly what they were back in Ultima 1. 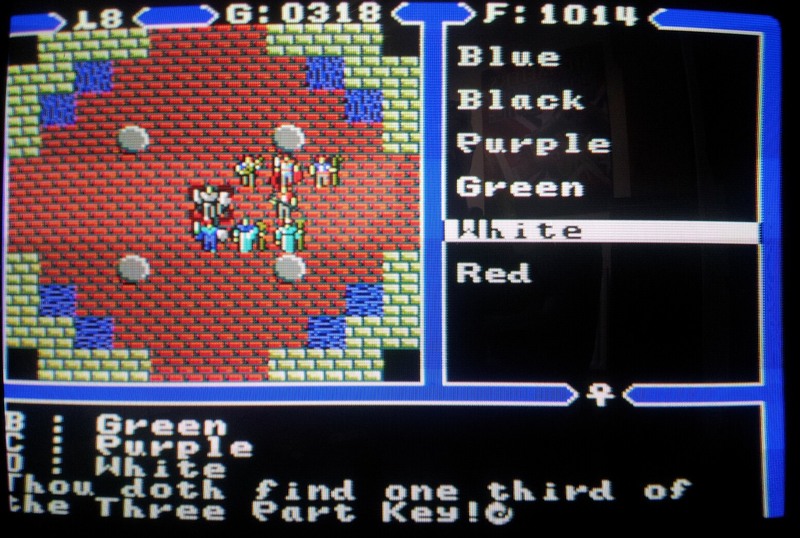 This was especially the case with Ultima 4 introducing the tile-based rooms within the dungeons which arguably provided the main challenge in this part of the game but left the player constantly swapping between viewpoints. On the whole I’m all for the variety this offered but the 2D dungeons here are almost as much fun as their counterparts and do feel more cohesive within the context of the rest of the game. The reduction in difficulty is more than negated by the fact that I’m unable to save in the dungeons. 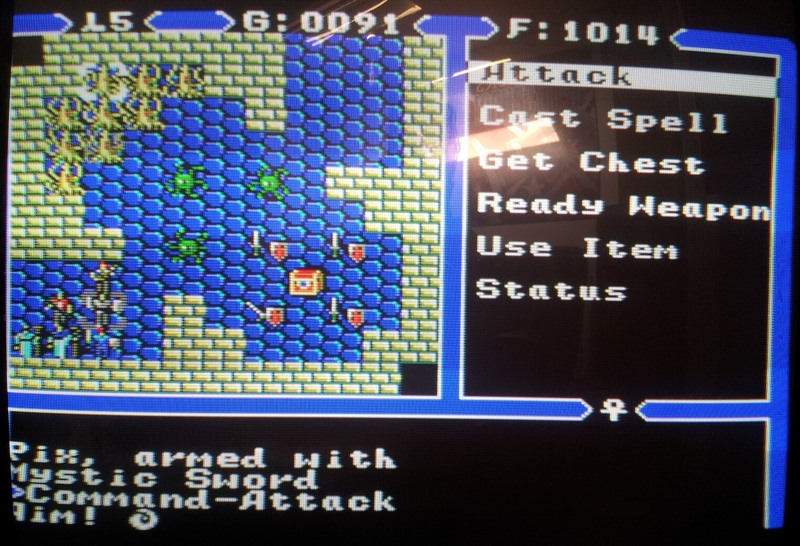 There also appear to be unavoidable monsters strategically placed around some levels which make life trickier still. Without the mystic armour I wasn’t really entirely ready for Hythloth despite leaving it so late into the game and ended up casting Exit from level 3 in a hasty retreat. I headed off to retrieve the white stone using the balloon after this. 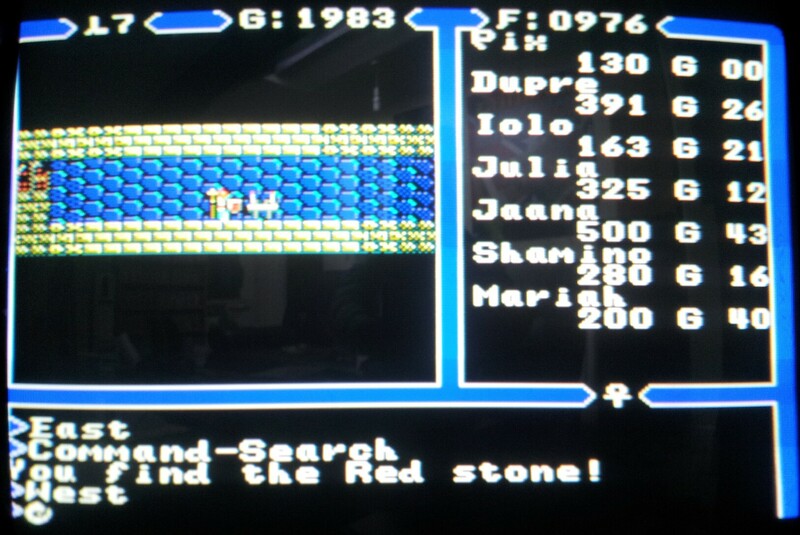 One oddity here is that because of the control scheme it’s impossible to land on the appropriate tile and then search for the stone. The button that brings up the menu with the search command is also the same one that puts me in the balloon and launches it meaning that I have to search while airborn swooping up the stone as we fly past. 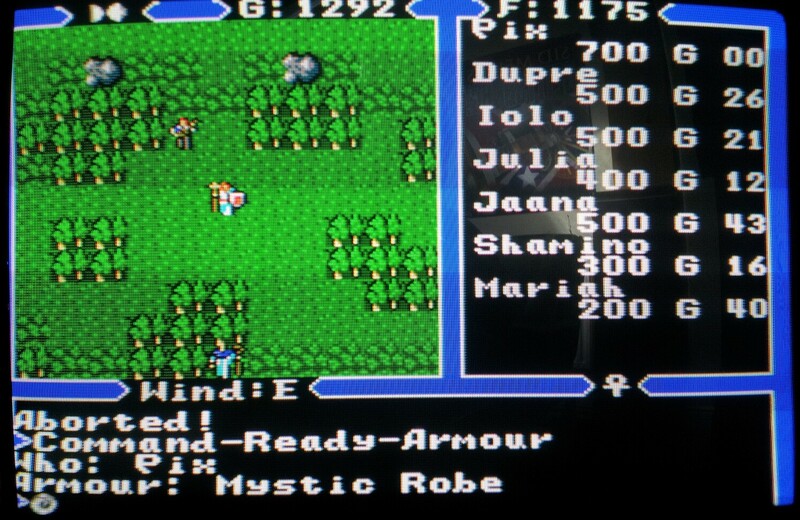 By this point I’ve reached level 8 and can grab the mystic weapons and armour (or robes in this version). Money is not plentiful in this game and most of my party had been going around with no protection whatsoever prior to this and armed with no more than slings. The next stop was Destard. Having the mystic robes certainly helps here and for the most part my largely inexperienced party is able to cope well. The exception is when I run into enemies that can cast sleep which are the bane of any band of would be heroes in Ultima 4. I manage to locate the altar with the red stone although I’m not sure the altar tile graphic would convey what it was if I didn’t already know. When playing U4 I would usually flit between dungeons via the altar rooms at this point picking up all the stones as quickly as possible. I attempted that here but started to get nervous with not being able to save the game and my party struggling with some encounters. I’d hate to lose an hour or more of gameplay so after raising the stats of the front line of my party via some orbs I beat a retreat back to Lord British to heal up. I’ve amassed some gold throughout this last dungeon raid so the plan now is to blow the lot on reagents and go back in far better armed this time around. I think some liberal use of up and down spells is called for to speed things along a bit. I’ve still some way to go but part 4 should see me to the end of the game. Before that tomorrow marks the 5 year anniversary for this blog so I really should do something to mark the occasion. I’ve no idea what that will be yet but you can expect a post or two when I figure it out.